AJ: We know there’s Masonic influence in the founding of the country …what is the Masonic influence on NASA? Aldrin: As far as I can tell, zero. There were some Masonic brothers of mine in Texas that wanted me to take some kind of a Masonic emblem to the moon, and some gesture of – I don’t know what it would be a gesture of – but I told them that it was not within my …my authority to do such a thing. 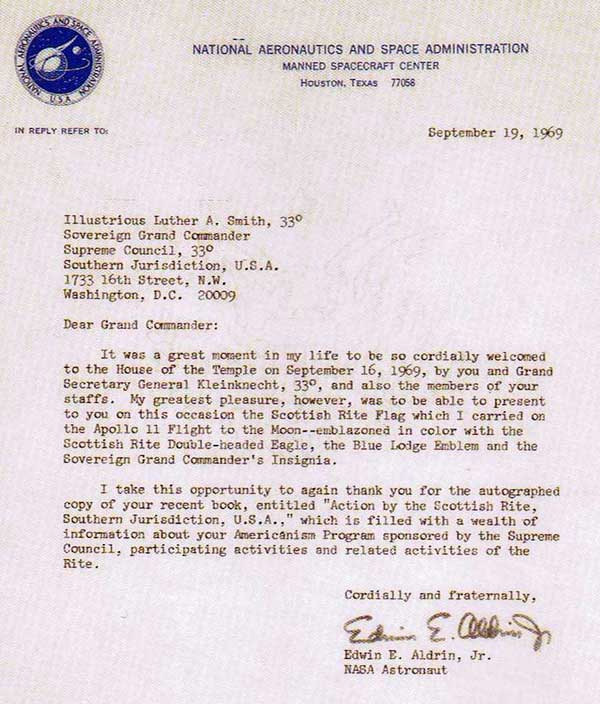 That’s funny, because there was an article in the New Age Magazine, December 1969 (the official organ of the Scottish Rite Southern Jurisdiction), replete with pictures of Aldrin presenting to the Scottish Rite headquarters in Washington, just such an “emblem” which he had carried with him to the moon and back. Moreover, Freemason Chris Hodapp recently wrote of further Masonic meddling during the Apollo 11 moon landing. While he was on the Moon, Brother Aldrin claimed our lunar neighbor for the Masonic jurisdiction of the Grand Lodge of Texas. Aldrin was a member of Clear Lake Lodge # 1417 in Texas when he stepped onto the surface of the Moon. He carried a special deputation from the Grand Master to claim it as being in the territorial jurisdiction of the Grand Lodge of Texas. In the wake of Aldrin’s Masonic space mission, the Grand Lodge of Texas formed Tranquility Lodge No. 2000, named after Tranquility Base, the location of Apollo 11’s landing. Why the dissembling in the interview? And what, Freemasonry, think ye of such a denial? But the question you must ask yourself is, who really cares? And in what way did or does this effect you personally. You cared enough to leave your two cents. Typical government believers. Incapable of expressing concerns that extend beyond the confines of their own existence. it matters when a government entity like NASA spends billions of your tax dollars exploring space on your dime for ‘the enlightenment of all mankind’ and then secretly goes about investigating possible alien artifacts on the moon because of it’s core belief in ancient Egyptian religion. that’s why. I just want to say Terry I love your show and keep up with the truth because many people are too ignorant to even see it for themselves and still denies what’s happening around the world. Whilst you are correct to address an error for the sake of truth-are you really still persuaded that men went to the moon. Earth [and the moon] travel at 64k miles per hour around the sun. You still beleive a tin can coped with that between Earth and moon and coped with it on the moon and back to Earth.